People with a disabilities are at increased risk of developing nutrition related health problems. More people with a disability are underweight and overweight than the general population. Swallowing problems (dysphagia), bowel disorders, reflux, diabetes and poorly balanced diets are also commonly seen. Due to HSE Dietetic services shortages, when HSE cover is unavailable, Gillian provides a clinical dietetic service to adults (>18 years of age) by helping to facilitate a positive change in food choices amongst individuals, groups and communities with disabilities. Service users are seen with other members of the multidisciplinary team when appropriate. 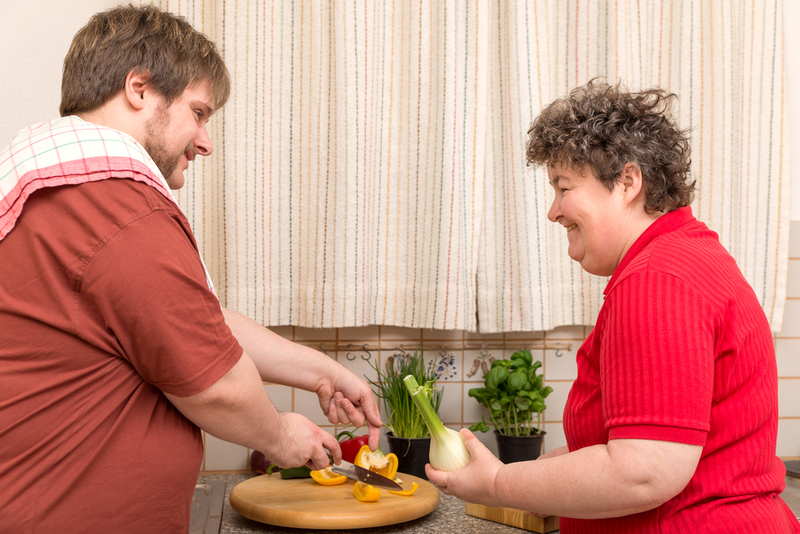 With the move to community care for people with a disabilities, it has been recognised that there is a growing need to support both service users and carers in the provision of nutrition for adults with a disability. Gillian helps support and enable individuals and care staff to provide nutritionally adequate meals (including fluid) and empower clients to make an informed choice. Individualised, holistic advice is given – taking into account the wider medical, social and cultural situation. Advice is always non-biased, practical and based on best practice. Emphasis is put on minimising the risk of nutritional inadequacy. Gillian can help tackle rigid feeding choices, food phobias, dysphagia, long term enteral feeding issues. Gillian has been trained in behavioural change and is skilled in using approaches to helping individuals change their diet and related lifestyle. Training is targeted and specific taking account of nutritional challenges faced with learning disabilities. Information provided for individuals will take into account inclusive communication and will be appropriate to level of understanding. Gillian will always try to be central to development and implementation of nutrition protocols. Is involved with ensuring good food provision to individuals to help improve health. Undertakes research and audit to evaluate services to improve the life of people with learning disabilities. Gillian currently provides dietetic services to St. John of God’s Disabilities Service Users in Ravenswell, Bray, Co. Wicklow and the surrounding community houses and also St. Raphael’s in Celbridge, Co. Kildare. Gillian also provides Dietetic services to St. Joseph’s House for the Deaf and Blind and also the Anne Sullivan Centre in Stillorgan, South County Dublin. Gillian has implemented new menus, visual recipe booklets for service users and developed online Dietetic video content for staff training. Gillian will undertake an assessment will determine the nutritional aims and develop a care plan for continuing care. Clients will be discharged when the identified nutritional aims have been achieved or in some instances when it has been determined that Dietetic input is of no more assistance to that individual. GP’s, consultants, social workers, key workers, allied health professionals e.g.Speech and Language Therapists and Physios, can all refer to the dietitian. Contact Gillian on 085 7708940 or email gillian@insideoutnutrition.ie to make a referral and book consultations.